Ever had a bad day, one of those days when everything seems to go wrong or everybody seems to be out to get you? And as a result you just decided “F….orget it! But it’s how we handle them that makes all the difference whether it’s personal enrichment or professional success we’re after. If you’re not where you want to be in life, perhaps it’s because you’re letting your emotions get the best of you. When you learn how to control your emotions and not let them control you, you’ll be more confident and poised, more powerful, more impactful and more successful in your life. Nobody has good days all the time. Our feelings and emotions are part of what makes us human, what’s helped us to survive for thousands of years, and often what helps to propel us forward in life. Human emotions, even negative emotions, are natural components of life and exist for perfectly good reasons; each have their own unique purpose in a healthy life balance. We’re all emotional beings, including those of us who are extremely successful individuals. But how is it that some people are able to handle emotion productively, or at least not let it detour them from their path, when others aren’t (or at least not as effectively)? Do you think during the course of building phenomenally successful lives and businesses they’ve ever experienced negative emotions or had a bad day? Probably so, and lot’s of them. But can you imagine any of those individuals today being engulfed by, sidetracked or so overcome with emotion that they couldn’t do what it is they each do so well? Because they don’t have time nor can they afford to expend the energy and resources toward negative or non-productive outcomes. They’re way too busy developing wildly successful businesses, lives and philanthropic endeavors to waste time with things that are counter-productive. 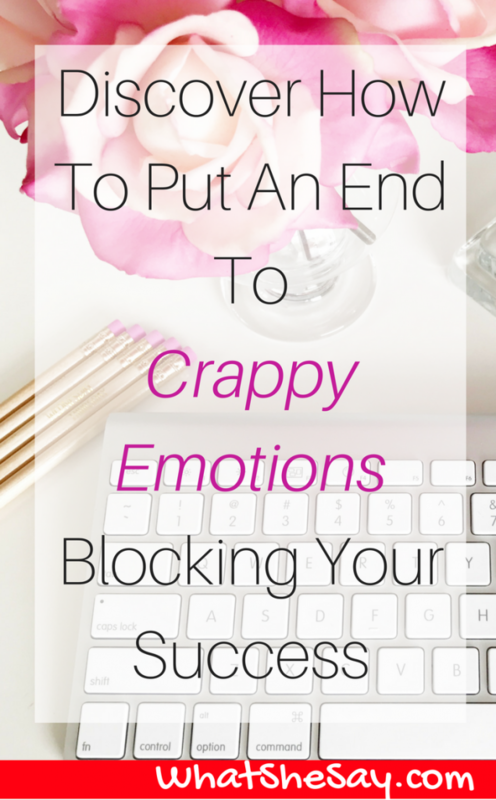 So, how can you take a page from their playbooks and master undesirable emotions? Let’s look at how a few of the most common “negative” emotions, namely fear, anger, and grief/sadness may be blocking your progress toward your best self, and what you can do about it. Fear, anger and grief are all rudimentary or basic emotions, and considered crucial factors by some in the survival and dominance of human beings throughout man’s early history. For example, fear provided us the ability to be acutely aware of danger or potentially dangerous circumstances. Anger allowed us to express aggression to protect and defend what was ours. And grief allowed us the ability to feel compassion and empathy toward others, which was important in forging social and community connections with one another. Nowadays however, when these and other “negative” emotions are allowed to linger in our consciousness, they can affect our personalities and behavior in ways that are undesirable, the results of which are usually neither good nor productive. Negative emotions use up precious physical and emotional energy and time; resources much better channeled in the direction of positive pursuits. Unfortunately though, too many of us get bogged down in negativity and emotions that don’t benefit us. We end up being distracted, exhausted or worse, and misguided or directed away from our intended objectives, goals and purpose. While in the past fear may have served us as an important instinctive survival mechanism, I would be willing to guess of all of our emotions, it is now the one emotion most responsible for keeping people from reaching their full potential. Fear of the unknown (how do I build a business), fear of what other people think (how will I fit in/everyone will think I’m an idiot for trying this), fear that “I’m not enough” (I don’t have the education or the experience required to do this), fear of failure (what happens if this doesn’t work). There are people who have lived their entire lives never venturing far from what is comfortable and familiar to them (even when what’s comfortable and familiar is bad), in order to avoid facing the new and unfamiliar (even when what is new and unfamiliar is good). In your personal life have you ever chosen not to voice your opinion, express your true point of view or live your truth because your family or your friends wouldn’t appreciate or willingly accept opinions different from theirs? At work, have you ever neglected to speak up when you knew you had a great idea or could offer a solution to an existing problem for fear your coworkers or your boss wouldn’t accept it because “you’re not qualified” and don’t have expertise on the subject? Have you ever deferred or delayed efforts to start your own business because you’re a homemaker or employee who’s never been in business before, even though you have years of knowledge and skills relative to the enterprise? Are you a maker or creative designer who won’t publish or market your work because you have tried and failed in the past? All of the above are noteworthy examples of situations where fear is blocking your ability to progress and move your life forward. You have the goods; you have what is necessary to succeed, but fear immobilizes you and prevents you from pursuing or achieving what you envision. The simplest thing to do is to change the way you think. One of the biggest differences between successful and unsuccessful people is how they think. So when it comes to the subject of fear, we have to train our minds to think differently. Imagine the worst that could happen if your fear is realized.Consider what the immediate consequences would be. After that, imagine what effect it would have on you in the long term. Chances are you will discover that while the immediate outcome of what you fear may be undesirable or uncomfortable, when the issue is framed in the long term, any lasting effects are not nearly as bad as you thought they might be. Using this technique to process your fear allows you to better see the thing you fear in a more balanced perspective, so you can then more accurately determine the severity of the perceived problem and what your level of response to it should be. 2. Consider your situation from an objective perspective. When contemplating the thing or circumstance you fear, take yourself out of the scenario and consider it as if it were happening to someone else.How would you advise that person to deal with what you fear? In considering your fear from this perspective, you remove yourself (and your emotion) from the situation. This allows you to consider things from a neutral and unbiased viewpoint to give you more clarity and rationale in your contemplation of a solution. Fears thrive and grow in an atmosphere of chaos and uncertainty.When faced with something you fear, make a plan; in fact make three. Consider your fear or what you think may happen as a result of what you fear, then choose three different ways in which you can respond that will lessen and ultimately eliminate the associated threat or consequences. Then whether or not what you fear becomes reality, you are prepared for it and can deal with the issue appropriately. In the pursuit of achieving a goal or becoming successful, we often entertain unrealistic expectations of perfection or the belief that “failure is not an option”. And while striving for perfection is a noble aim, truth is none of us are perfect, and every successful person I’ve ever heard of has experienced their share of failures. So, cut yourself some slack. Realize that if failure is what you fear, and if you fail, you’re in good company and the world won’t end. You can learn from your mistakes, recover from the failure, and try again. 5. Step into the unfamiliar. As human beings we’re often creatures of habit and comfort.We like what is most recognizable and familiar to us. But often that behavior breeds fear when we’re faced with that which is different and unfamiliar. If you discover that your fear shows up when you venture into new and different situations or places, then a good remedy is for you to journey into unfamiliar situations or places. As you purposefully do this, you place yourself in a position of greater control. You remove the element of surprise and added pressure of being caught off guard. You can then safely and comfortably investigate new environments and become accustomed to and familiar with them at a pace that is comfortable for you. And as you repeat the experience, you’ll become increasingly accustomed to being in unfamiliar circumstances or surroundings, and grow to be more comfortable with those situations. In time, your fear of the unfamiliar will greatly decrease and may disappear completely. Now, let’s talk about anger. Anger is a strong emotion with which we’re all familiar. I’m not normally an angry person, but anger is an emotion with which I am intimately acquainted and with which I share a long history. Like fear, anger originates in one of the more instinctive parts of our brains. Whenever we’re threatened, mistreated, insulted, or injured by another, or when there exists that perception, anger is often a result. But, not all anger is bad. Many issues and circumstances, from societal ills like discrimination and injustice, to personal relationship problems like dishonesty and betrayal, might never be resolved in the absence of righteous anger. Anger becomes problematic though, when it presents itself in conjunction with aggressive and uncontrollable behavior. If you’re prone to inappropriate or violent outbursts or physical aggressiveness as a result of anger, that’s evidence of a problem that needs correction. Fortunately, the majority of people don’t fall into that category. However, another form of anger that is just as troublesome, if not more so, and may be much more common, is chronic or internalized anger. With chronic anger, you can experience anger over a perceived injury or hurt for sometimes years. Often in these cases, the original anger is repressed and unexpressed at the time the actual event takes place. So it “festers” over time and can cause difficulty with developing and maintaining healthy personal and professional relationships. It can also cause very real physical problems. Increased blood pressure, increased risk for heart attack and stroke, and problems with your immune system can all be results of chronic anger. Holding a “grudge” is a form of chronic anger. Years ago, I had an experience with someone I considered a friend. There was a betrayal in the friendship and we parted ways. For years I was angry with her because I felt extraordinarily wounded and disrespected. Whenever her name came up in conversation, I could literally feel my pulse begin to race and my face flush. My mind would remember and replay the details of the situation all over again and I would think how much I disliked her, what a terrible person she was, how someday she would have to pay for her actions. Then one day, I came to a realization. She had gone on with her life. She didn’t care that I was mad, she didn’t care that I was hurt. I was no longer a part of her life. She wasn’t feeling any of my rage, or hurt or disappointment, and she never would. The only person still feeling awful about the situation was me because I was still carrying around all that toxicity, both emotionally and physically. And I finally let go of all that emotion and the heaviness and negativity that was with it. If someone has wronged you, cheated you, betrayed you, hurt you, you have to find a way to deal with it and move on with your life. Whether through forgiveness, reconciliation or finding a way to simply put the matter away and out of your life permanently, you have to deal with it and move on. Otherwise, you’ll be the one left stuck, miserable and suffering because you can’t move forward without some type of resolution and closure. 1. Know that sometimes you have every right to be angry, but don’t let it last. Life happens. Not every day is going to be perfect. We are imperfect beings living in an imperfect world. And sometimes things happen or fail to happen that make us mad. When something of this nature happens to you, give yourself permission to experience your true emotions. Feel angry, but don’t wallow in it. In most instances anger is an immediate reaction to some unexpected circumstance. Experience it, feel it, then choose how you should proceed in response to the situation and move on. I know.Easier said than done when you’re experiencing emotion as raw as anger. If you allow yourself to remain in a highly agitated state, you’re more apt to do or say something you’ll live to regret. So count to ten, walk away, separate yourself from the immediate source of your anger, take a breath, do whatever you need to do to calm yourself. Then address the circumstance as calmly as possible to resolve the situation and move on. 3. Address the source of your anger immediately to overcome or resolve your feelings. Sometimes when something makes us angry, we avoid the situation altogether. Problem is, if there’s a conflict or issue that makes us angry, we’re still angry about it especially if we don’t address the problem and source of our anger. Don’t avoid situations that make you angry. Deal with the situation promptly, directly, find a resolution and move on. 4. Put things in perspective. While all of these are examples of situations that could be frustrating, inconvenient or ill-timed, are they really situations that warrant anger? In the long run, how much do they really matter? When faced with these type situations, which are all part of everyday life, make certain to put things in their proper prospective. You’ll be angry much less often. In fact, you may find that you have a laugh or two at your own expense and learn not to take yourself or other people quite so seriously. 5. Learn to communicate your feelings effectively and completely without anger. Sometimes anger originates within us from a place of frustration that we’re not being heard or understood. And sometimes we share the fault in that. By taking the time and making the effort to learn different, more effective ways of communicating with others (like being assertive and straightforward in stating our perspectives or positions on an issue, or learning to actually listen not simply hear someone else’s view when it isn’t the same as our own), we can sometimes avoid situations that cause us to be angry. For over ten years, I commuted nearly 100 miles per day to and from my job. I can’t tell you the number of times I saw the aftermath of accidents and witnessed near misses as people rushed to get to work. And I always found it puzzling. I thought, if the possibility of being late for work stresses you out causing you to speed, drive dangerously across roads and highways and become frustrated with other drivers who are on time with their schedules, then don’t be late. You should start your activities early enough in the morning to avoid putting yourself in that stressful situation. The same goes for any situation of which you’re aware that has the potential for making you angry. Don’t put yourself, or allow others to put you in situations that will cause you to be stressed and become angry. A little forethought and planning can help you to reduce your level of stress, as well as the instances where your anger might be generated. Nobody’s life is perfect no matter what it may look like to those of us on the outside. Life is filled with unpredictability, and with that comes loss, disappointments, heartache. All those things are part and parcel of the journey each of us are on. But when you’ve lost a loved one through a death, a spouse/lover/friend and partner through divorce, or a job or career through down-sizing, closure of a business or the failure of an industry, sadness and grief can seem overwhelming. Your sense of identity and how you fit in the world can be shaken or destroyed, and you can experience a vast range of feelings and emotions including unhappiness and despair, anger, confusion and even relief. To overcome situations of grief and sadness, we have to see instances of loss and sorrow for what they are…natural occurrences in the course of life that are temporary moments in time. Unfortunately, there are those of us who can become stuck in a season of grief or sadness and behave as if those emotions and circumstances will dominate the remainder of our lives. And, when that happens, we can lose perspective, hope and vision for the future, and have difficulty moving forward. So, how do you overcome these emotions? 1. Give yourself permission to grieve and to do so however is best for you. When something tragic or unexpected happens, when a dear friend or loved one dies, if you lose your job or your companion pet has to be put to sleep, or any of a million other things happen to make you sad, you have the right to grieve that loss and experience that sadness.Being stoic is not only overrated, but also potentially unhealthy. Putting up a good front to make others feel comfortable or okay only means you are pushing down your genuine emotions and masking your truth (lying), both of which will most likely lead to problems in the future. However you feel about your loss, allow yourself to feel it, to go through your emotions and to express them or not as makes you comfortable, and provide you solace and relief. 2. Allow yourself time to grieve. Don’t rush through your grieving process or period of time in which you feel sad. Sometimes because of our own self-inflicted pressure to appear “okay” or because of input from others or fears about appearing “weak”, we think we have to rush through periods of grief and sadness. The healthiest thing you can do for yourself during periods such as this is to allow whatever time is appropriate for YOU to experience what you need to experience, and feel what you need to feel to get through your situation. People grieve differently depending on all sorts of factors, but everyone has the right to take whatever time they need to deal with their specific circumstances and grief. 3. Acknowledge the significance of the person or thing you’ve lost. Think about the person or thing you’ve lost or that you’re sad about.What did the relationship they had with you consist of? How did they contribute to or affect your life? What was the impact of their presence in your life? How are you better or changed as a result of your connection to them? What gifts from them or your experience with them will you carry forward in your life? What are the lessons? 4. Assess your life and situation through the lens of your loss. Once you’ve had time to acknowledge and experience the grief of your loss, take time to evaluate your present situation and then objectively visualize how the loss will impact your life going forward.What have you actually lost, what can you gain, how will the nature of your life change? 5. Decide how you will move forward. In the aftermath of loss, it is sometimes difficult to consider how you will move forward.But the fact is if you’re not dead, if you’re still breathing, then move forward you must. If you linger in your grief, you can lose sight of not only what’s important, but also what’s possible. So take a beat, take a moment, take time out and decide how you want to proceed from this point forward. Consider all options open to you, not only what’s easiest or most appealing, then consider the options that offer you the most benefit or opportunity for improvement and success, map out a plan and get going. At the beginning of this conversation, we started by talking about crappy emotions and crushing them. The truth is everyone experiences negative emotions during their lifetime regardless of who they are or their position in life. The difference between successful, happy and well-adjusted people and many of the rest of us is that successful people have often found better ways to deal with “negative” emotions and experiences to limit the undesirable consequences and outcomes they may have. Negative emotions have their place and are a normal part of life, but they can devastate our ability to progress if left unchecked or if we fail to deal with and resolve our issues. Experience your emotions, control them, deal with them, learn from them, then get on with the business of creating your extraordinary life. Was this post helpful to you? Let me know in the comments. If so, please think about who you know that needs to read this and would be encouraged and benefit from this information in their personal journey. Then share this message with them. Thanks!